I've been spending my summer in 1960's floral shift dresses, enjoying the bare legs that seemed like such a rarity back in foggy San Francisco and loving my new short locks. I acquired a lot of new freckles on a recent beach day spent with Liz and Emily and I'm feeling slightly guilty about being just a tiny bit tan (for me, that is). I've learned to embrace the occasional and incredibly indulgent "mani pedi" afternoon, and I will never tire of seeing the bewildered looks I receive when I request alternating nail polish colors or polka dots or something else silly (or at least silly by Philadelphia standards). I'm looking forward to going home for a visit at the end of this month and I can't wait to visit my old haunts and hug a lot of folks that I've been desperately missing (you know who you are) and sing karaoke every night. Summer, it's been pretty wonderful so far and I'm looking forward to the second half! I'm loving the print of your dress!! Super adorable!! Such beautiful pictures, and really loving the shirt hair on you…it makes me slightly tempted…. the pattern of that dress is so so pretty! i love the color scheme, and lovely manicure! I'm so glad you're having a great Summer. 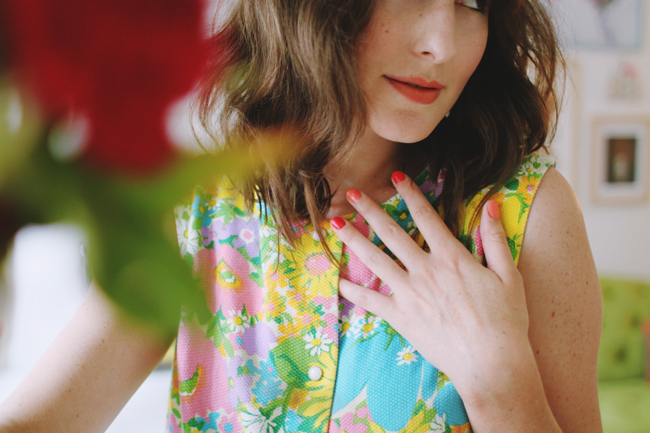 Spending the Summer in vintage shift dresses is the only way to spend it! That print is just the best! I love vintage florals. The colors in this one are awesome! I am so excited about your visit! I have it marked on my calendar. I'm gonna give you a great, big hug! that dress is so dreamy! If you love fashion, design, art and everything spice, you will adore it!! Your blog is amazing! I love your vintage pieces, I recently started my own blog I would love to be a reader, please follow my blog back. Can't wait to visit SF next year. Ah, I'm in love! 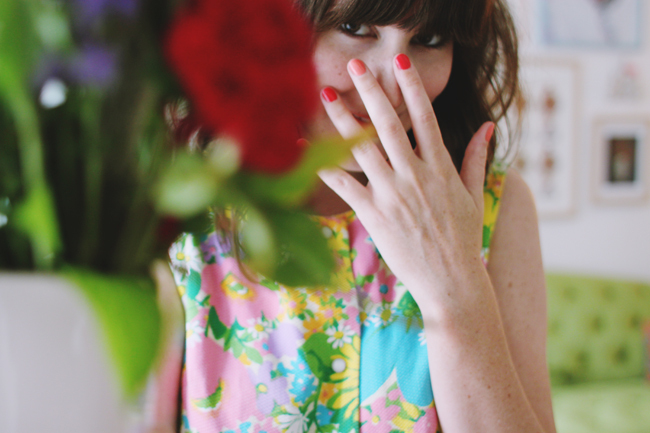 The 60s inspired theme is perfect with bright nails! You are wayyyy too cute for your own good. Love this print!